An overhead view of Portland's Ocean Gateway terminal, with areas designated for use by the Nova Star ferry. PORTLAND, Maine — An eventful week for the return of ferry service between Portland and Yarmouth, Nova Scotia, was capped Saturday by the departure of the Nova Star from Singapore. Dennis Bailey, spokesman for Nova Star Cruises, on Monday said the ship is expected to arrive in Yarmouth by mid-April, perhaps a week after Portland city councilors vote on a seven-year lease for the Ocean Gateway Terminal. On March 12, the City Council Housing and Community Development Committee forwarded the lease for a full April 7 council vote. Committee approval, with two slight amendments, came the same day Nova Star Cruises appointed managers for the Portland and Nova Scotia ferry terminals. Eric Junker, a Southern Maine Vocational Technical College (now Southern Maine Community College) graduate, was appointed terminal director of operations in Portland. Junker now works for Americana Marine Service in San Rafael, Calif., outside San Francisco. He has experience operating a 1,000-passenger ferry service between Puerto Rico and the Dominican Republic. Mark Muise was named director of operations for the Yarmouth terminal. A former manager of the Scotia Prince line, Muise is a Yarmouth, Nova Scotia, resident, Bailey said. On March 12, Bailey said the ferry is expected to begin service May 1, although the company is not yet able to post fares or sell tickets. That will happen as soon as the Federal Maritime Commission accepts a $2 million bond Bailey said is required to ensure any possible refunds can be made to customers. Bailey said the company, headed by Maine Maritime Academy graduate Mark Amundsen, knew it would have a tight schedule to launch the service. “We knew when they awarded the bid it would be a sprint,” he said. Still looming at the finish line is a lease to operate in Yarmouth, but Bailey said negotiations are expected to be smooth. “They are so excited in Yarmouth they will move heaven and earth. This was their baby from the get-go,” he said. The 528-foot long Nova Star, built in 2010 for anticipated service in the English Channel, has 163 cabins and 652 berths to accommodate up to 1,250 passengers. Bailey said the company hopes to draw 100,000 passengers in an operating season from May 1 through Oct. 31, with the expectation that July and August will be the busiest months. The ship will leave Portland every evening on overnight trips to Yarmouth. Previous ferry service ended in 2009, when the Nova Scotia government cut off its annual subsidies for the high-speed Cat ferry, which operated at a loss for three years. For the prior 35 years, ferry service connecting Portland and Nova Scotia was provided by the Prince of Fundy, Bolero, Caribe, Marine Evangeline and, more recently, the Scotia Prince. Compared to the Cat, a catamaran vessel which made the commute in just more than five hours, the Scotia Prince was a monohull cruise ship which made the trip in 10-12 hours. Nova Star trips are expected to take about nine hours. Bailey said passengers can expect a smoother ride and more amenities, including three restaurants and an on-board casino. The operations are subsidized with $21 million Canadian dollars from the government of Nova Scotia over seven years, including the $2 million bond needed by the FMC. The proposed Ocean Gateway lease could generate $150,000-$400,000 in annual revenue, city Economic Development Director Greg Mitchell said. 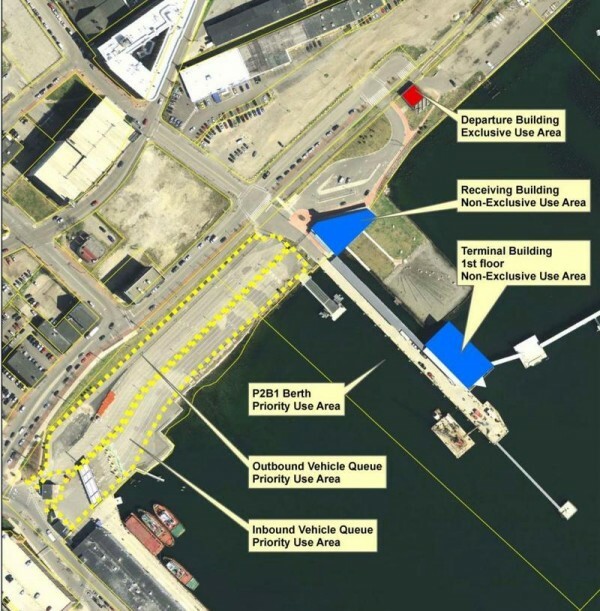 Nova Star Cruises will lease a 1,600-square-foot departure building east of the terminal, and it will be assessed a $2.50 fee for each departing and arriving passenger. The company will also be charged $3 for each car or other passenger vehicle in the first year and $5 in the second year. Buses and commercial vehicles will be assessed a $20 fee at first, and the fee for commercial trucks will increase to $25 in the second year. The council committee reduced the second year fee from $30, and it also added a one-year option at the end of the lease so it would span the time frame of Nova Scotian subsidies. Nova Star Cruises will have shared use of the receiving and terminal buildings at Ocean Gateway, and the Nova Star will berth on the west side of the terminal, away from arriving cruise ships. The lease also provides exclusive use of a separate building for departures. Bailey said the company will also spend about $225,000 for terminal infrastructure. “This is for passenger screening and documentation, and will include new fences and gates, more lighting, and modifications to passenger screening booths,” he said.